Brush a baking sheet with some of the melted butter. Wash and peel your butternut squash then slice in half long ways. Continue to make large slices out of the butternut squash long ways. 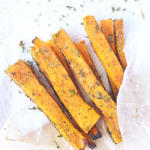 Slice the curved portion of the squash off then cut thin slices (like fries) out of the long chunks of squash. Place on the baking sheet and brush fries with the rest of the melted butter. Sprinkle your fries with each of the seasonings, liberally, then place in the oven and bake for about 20 minutes or until crispy.